Stuff Points: Earn 58 points when you buy this stuff. Place on any flat surface to add a spiritually captivating decoration that calms and relaxes. This high quality fountain can be used on a table or shelf inside your home, or it can be placed outside on your deck or patio. It is a table model fountain, and is constructed from durable fiberglass that gives it a natural look without the high cost. This fountain looks like it was carved from natural stone, but it is actually molded from a much lighter and less expensive material. It remains incredibly durable and long lasting, and when viewed from a distance, it is almost impossible to tell. The WIN322 Buddha Fountain features an underwater LED light that enhances the appearance and makes it the perfect decoration for lazy evenings in your living room, or lively nighttime parties in your backyard. It comes complete with a powerful pump to move the water, and is protected by a one year warranty from the manufacturer. Setting it up is simple and will only require a few minutes of your time. Simply place on any level surface, fill it with water, and then plug it in to start enjoying the relaxing sounds and beautiful look. A contemplative Buddha figure sits at the center of this model, and he is holding a natural lotus blossom. The main body of the fountain is oval in shape, and features jagged, triangular cut outs that form a border around the centralized figure. The back portion of the unit appears to radiate outward behind the figure to fully surround and frame it. At the middle, an underwater light shines up through the water to illuminate the Buddha figure sitting in the middle. When you turn it on, water will pump up to flow out from the top of the flower only to spill over, and trickle down the face of the fountain. The water gently travels down to collect in the base, and then pump back up to continuously cycle. Natural water sounds will be created as the stream splashes and moves over the differing textures, and it will easily set the mood anywhere you place it. Although the fiberglass material will save you money, it will not be any less durable. You can place it outside in nasty weather, and it will not effect use because extreme heat or cold do not harm the material, and the coloring is not topical, so it will not fade with exposure to the sun. This unit features interior lighting, so it is great for evening use, but it will also benefit from this enhancement during the day as well because the light from below allows the textures to become more prominent. Perfect for the patio, deck or by the pool, this fountain would enhance any backyard decor. Due to limited splashing, and small sizing, you can also use this model inside as well. 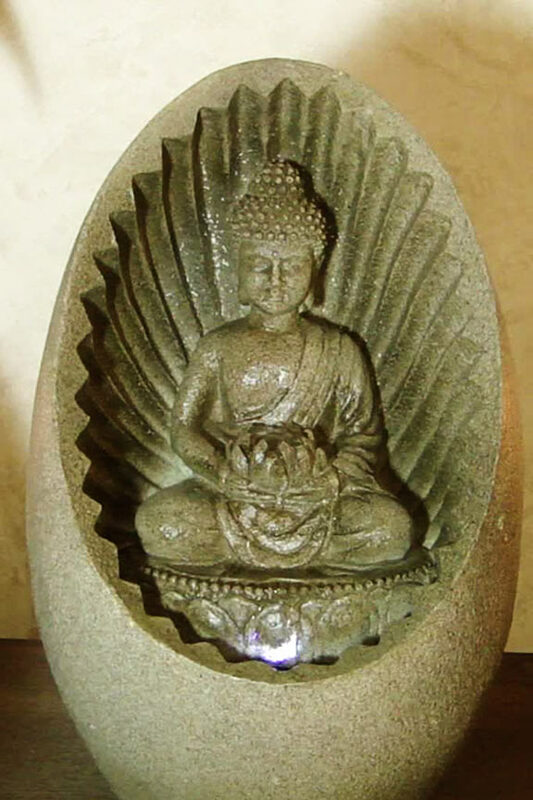 The WIN322 Lighted Buddha Fountain will upgrade the appearance of any space, but it will also add relaxing background noise to soothe and block out other unwanted sounds. Order Yours Today! 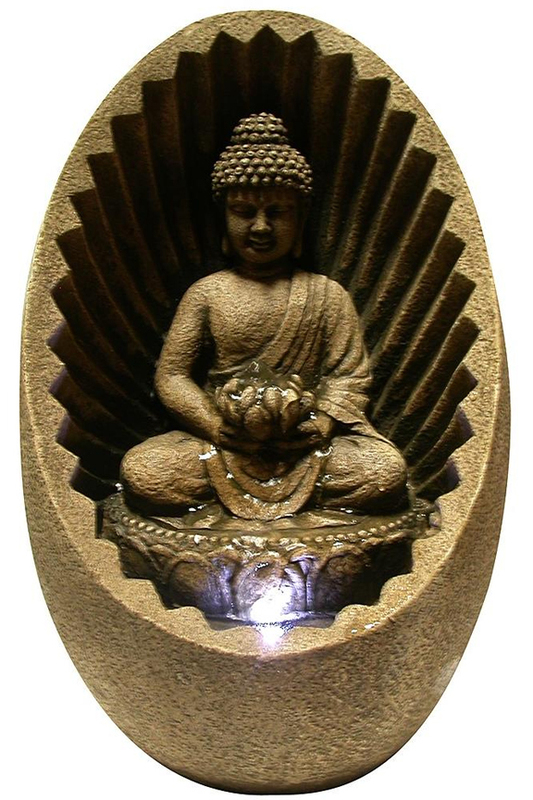 Lighted Tabletop Buddha Fountain - A natural humidifier and decorative accent. Super bright LED light adds to the appeal Use indoors or out, on any flat surface. Order Yours Today! The Perfect Water Feature For Any Backyard, Garden Or Patio.